Overview: Students closely observe photos of a robin's wing, pose questions, and think about the "why" behind the adaptations they see. Before students view the Focus on Feathers photos, ask them try to draw a feather or wing from memory. Have students make KWL charts about feathers or wings. Ask students to describe one of the photos to a partner. Have them imagine they are "painting a picture" with words for someone who has never seen wings or feathers. 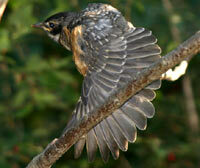 Pose this question and discuss it as a class: How do you think each thing (adaptation) you observed helps robins fly? Ask students to draw a robin's wing. This time they should label the parts and what they do. Home assignment: Ask students to observe wings on two different birds outdoors. They can draw what they see and/or come to class ready to answer this question: How are birds' wings and feathers the same? How are they different?